Canvas Shoulder Boat Bag - Monogram. Nothing makes a day start better than grabbing a large fun bag and setting off on an adventure. Take the kids to the zoo, for an ice cream, treat yourself to a pamper at the spa, take a friend to a book review. Whatever you decide to do, make sure your natural canvas boat tote bag goes with you! The colors are off white with navy blue trim and eco-friendly. The size is large enough to hold everything you need. 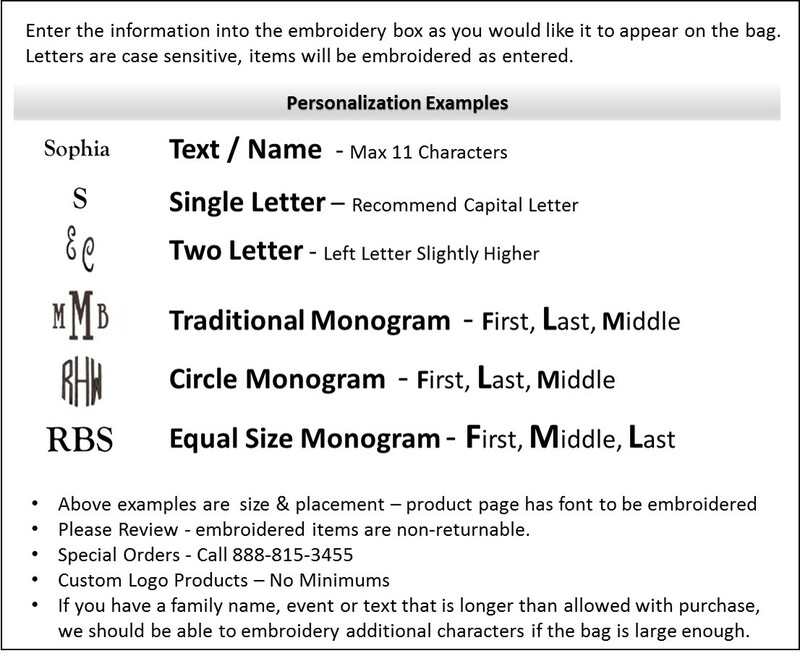 Let us embroider it with your personal initials or family name. Personalized embroidered canvas shoulder boat bag measures 20"W x 13"H x 6" across bottom. 12 oz. canvas. Stitched handles with snap closure. This bag far exceeded my expectations. I thought that for the price it would be extremely thin, but the canvas is thick and of good quality. The monogram looks great as well. Absolutely love this bag! We're having a destination wedding and I ordered 8 for my wedding party. I couldn't believe how well made these bags turned out. I had them personalised with the girls names and they turned out great! I ordered on a weekend and had them by Tuesday. Lighter-weight canvas than my Land's End boat bag, but still fine quality. Sturdy stitching and nice monogram. When the monogram didn't show up on my order, they immediately called and emailed me for it, so it still shipped on Monday! (I ordered it late Friday.) Great price, even with shipping added. Very pleased. I ordered 9 totes on a Monday. They were monogrammed and shipped the same day! Received them the next day! Bought these for bride and bridesmaids. The bags are large and sturdy and well made. Embroidery was very neat. Unbelievable service and the price can't be beat. Very well pleased!